Bridge cards are one of two defacto standard sizes around the world, the other being Poker cards. 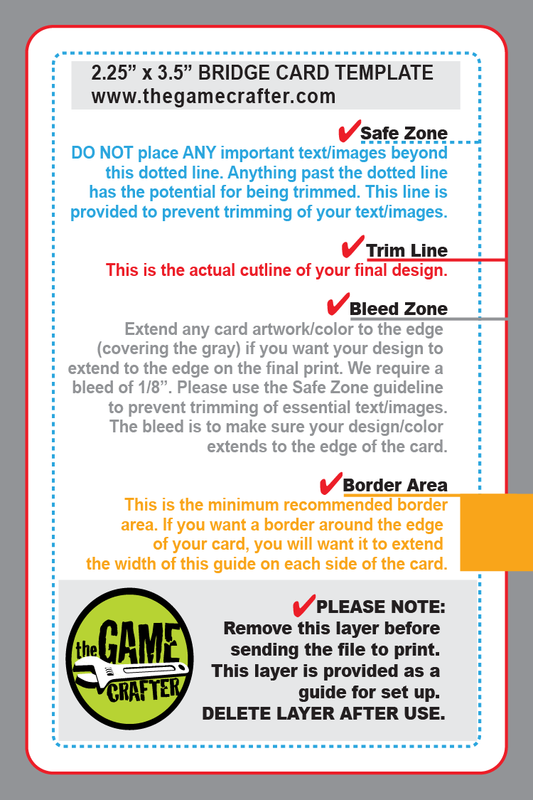 We don't recommend super thin borders on the backs of cards due to the potential for a small amount of front-back print drift. Cards are made from a 12 point 305gsm black-core matte card stock, which provides great color quality, sheen, and snap back. Cards do not come sorted, they are in a random order. If you intend to use your cards horizontally and wish for both sides of the card to be oriented in the same direction in print, you will need to rotate either the front or the back image by 180 degrees. Generally, the easiest way to do this is to rotate the deck back image (if using one).